Feed.shopping-day.com is the PUP that uses misleading techniques to prevent removal. Use Reimage to locate malicious components and get rid of them faster than with uninstall instructions. A full system scan blocks virus reappearance and prevents traffic to malicious domains. Feed.shopping-day.com is an unreliable search engine which is also known as a browser hijacker. In other terms, this fraudulent search directory aims to take over your popular browsers and ensure that you use only its services. Unfortunately, once it infiltrates your system, you will not be able to get rid of it easily. 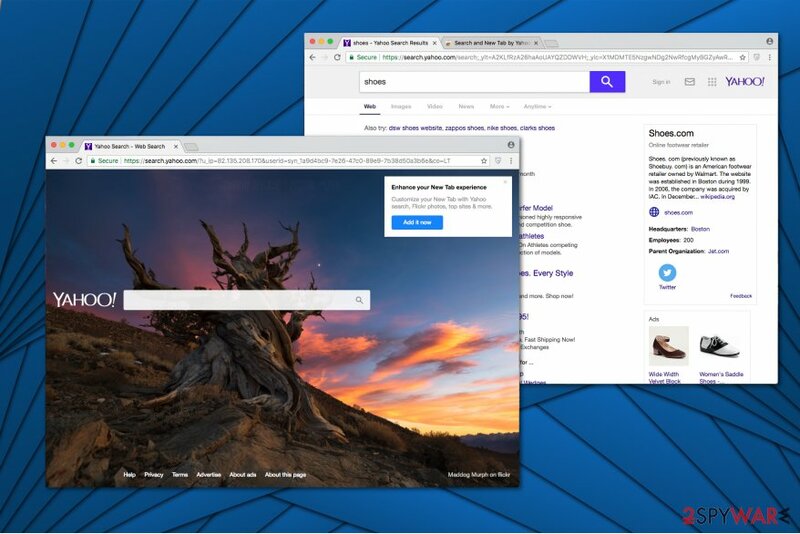 Developers distribute this potentially unwanted program as Search and New Tab by Yahoo extension for Chrome. While Feed.shopping-day.com is available in Chrome Web Store, it also spreads in software-bundles together with third-party applications. After FeedShoppingDay hijack, users can notice that their new tab URL, homepage, and default search engine is set to https://search.yahoo.com/?u_ip=. This, at first sight, legitimate search directory offers to bring a fresh look to your new tab page and provide quick access to the most widely used social media pages. We agree that the appearance of Feed.shopping-day is attractive. However, we want to warn you that such potentially unwanted programs are designed to collect details about computer users. Note that usually, the gathered information is non-personally identifiable. Although, there is a risk that you will unconsciously submit private details by yourself and developers will have full access to it. Additionally, Feed.shopping-day.com slightly alters its search results to bring traffic to the affiliate pages. In other terms, you cannot fully trust this search directory since it aims to redirect you to specific sites and increase pay-per-click revenue. While such marketing techniques are completely legitimate, the only ones who gain from it are the contrivers of this potentially unwanted program rather than the users. 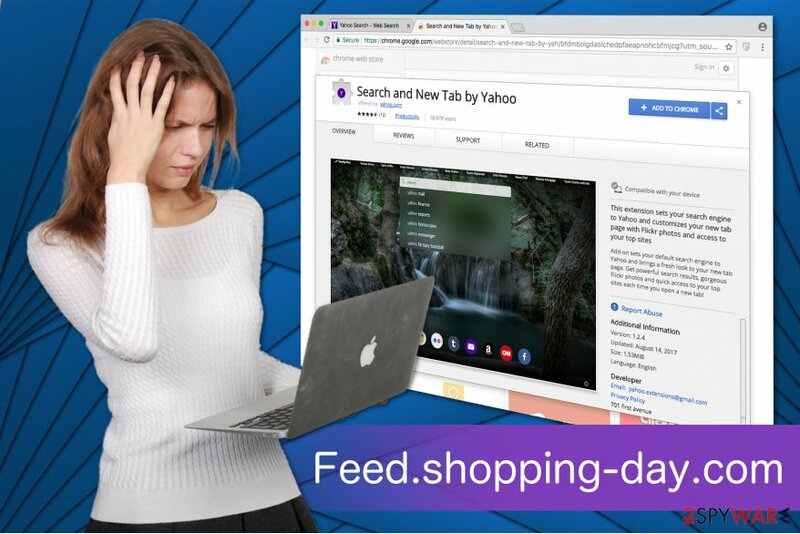 Feed.shopping-day.com is a potentially unwanted program which is distributed as Search and New Tab by Yahoo extension on Chrome Web Store. Finally, experts warn about Feed.shopping-day.com redirect tendency. This browser hijacker can significantly increase the amount of advertising content on your frequently visited pages. Note that such activity can be not only annoying but also dangerous. It is because there is a risk that this unreliable search engine will redirect you to suspicious pages where malware is distributed. Likewise, the best option would be to choose a more reliable search directory instead of this one. Since it might be hard to remove Feed.shopping-day.com from your system, we have prepared step-by-step instructions. You can find them at the end of this article. However, an easier way to complete Feed.shopping-day.com removal would be to employ an antivirus. Security software would quickly detect all potentially unwanted programs and their components as well as eliminate them within several minutes. We highly recommend Reimage. It is not a secret that developers of potentially unwanted programs use a popular marketing technique, called bundling, for the distribution of their products. While it is completely legal, users often are not even directly asked for permission to install the additional software because they choose Quick/Recommended installation mode. These parameters are designed to speed up the process and obviously skip important steps. Likewise, the pre-selected checkmarks granting the permission to install PUP remain hidden among optional components. If you want to protect your PC from browser hijackers, you must select Advanced/Custom mode, attentively seek for PUP boxes and de-select them. Some users use the definition of Feed.shopping-day.com virus since this browser hijacker tends to reappear often. Therefore, it is important to complete the elimination procedure properly and make sure that it won't disrupt your browsing experience anymore. Although, experts from BedyNet.ru describe it as a potentially unwanted program rather than a malicious virus. For that, you can remove Feed.shopping-day.com manually with the help of the guidelines below. However, this method requires patience and specific IT skills. So, if you want to save your time you should opt for a different elimination technique which is also possible. Automatic Feed.shopping-day.com removal requires a professional security software. Get one from the list below and run an entire system scan to detect the potentially unwanted program. Later, the antivirus will automatically eliminate the browser hijacker and its elements. If you see Feed.shopping-day.com every time you open your browser, follow the instructions below and get rid of this potentially unwanted program from your Windows system. Here, look for Feed.shopping-day.com or any other recently installed suspicious programs. Mac users can encounter browser hijackers as well. Likewise, the guide below will show you how to eliminate all potentially unwanted programs from the computer. Wait until you see Applications folder and look for Feed.shopping-day.com or any other suspicious programs on it. Now right click on every of such entries and select Move to Trash. When in the new window, check Delete personal settings and select Reset again to complete Feed.shopping-day.com removal. Once these steps are finished, Feed.shopping-day.com should be removed from your Microsoft Edge browser. Here, select Feed.shopping-day.com and other questionable plugins. Click Remove to delete these entries. Now you will see Reset Firefox to its default state message with Reset Firefox button. Click this button for several times and complete Feed.shopping-day.com removal. Since Feed.shopping-day.com spreads an extension for Chrome, you should find and delete Search and New Tab by Yahoo extension to complete the removal of PUP. Here, select Feed.shopping-day.com and other malicious plugins and select trash icon to delete these entries. Click Reset to confirm this action and complete Feed.shopping-day.com removal. Here, select Extensions and look for Feed.shopping-day.com or other suspicious entries. Click on the Uninstall button to get rid each of them. Here, look at the Homepage field. If it was altered by Feed.shopping-day.com, remove unwanted link and enter the one that you want to use for your searches. Remember to include the "http://" before typing in the address of the page. Now you will see a detailed dialog window filled with reset options. All of those options are usually checked, but you can specify which of them you want to reset. Click the Reset button to complete Feed.shopping-day.com removal process. ^ URL Redirect. Wikipedia. The Free Encyclopedia. This entry was posted on 2018-03-14 at 04:14 and is filed under Stealing programs, Viruses. You can quickly scan the QR code with your mobile device and have Feed.shopping-day.com manual removal instructions right in your pocket. How did you remove Feed.shopping-day.com?